I’m working on a switches deployment project these weeks where redundancy and high capacity is important. Of course!! Who don’t want redundancy and high capacity? It depends on who you are talking with but there are people who think switches can be deployed with the configuration by default and switches only have to be connected to the network, which means their networks are flat without layer 2 segmentation or loop avoidance configuration. There are also people who think they can’t mix switches of different vendors due to Spanning Tree compatibility. However, if you are a network engineer, you’ll know switches should be configured, for instance, for loop avoidance to control topology changes and get redundancy and high capacity. The Spanning Tree Protocol (STP), originally standardized as IEEE 802.1D, is easy to understand and it should be known by network engineers. It is an ancient protocol for building loop-free logical topologies to prevent bridge loops and broadcast radiation. This protocol is easy to understand because switch ports can only be either a root port (RP), a designated port (DP) or a blocked port (BP). However, this protocol is no longer used because it can take 30 to 50 seconds to respond to a topology change, which is too much time. STP improved to RSTP (Rapid Spanning Tree Protocol). Standardized as IEEE 802.1w. RSTP is backwards-compatible with the standard STP as well as it is faster after a topology change because it takes few seconds (default: 3 times 2 seconds). On the other hand, RSTP port roles has been increased to five (root, designated, alternate, backup, disabled) instead of STP’s original three. 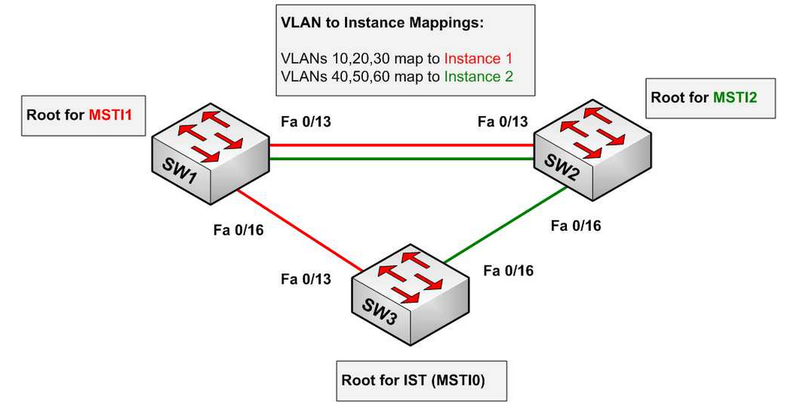 In addition, Cisco has released STP alternatives such as PVST, PVST+ and RPVST which support Per-VLAN Spanning Tree. 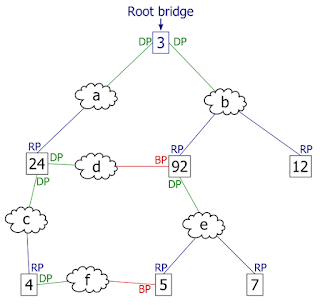 The next step was to develop the Multiple Spanning Tree Protocol (MSTP). Standardized as IEEE 802.1s. 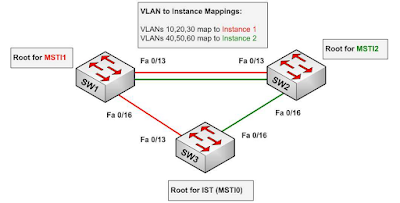 It is a protocol backwards-compatible with RSTP and STP but it also supports Per-VLAN Spanning Tree, where we can configure group of VLANs as multiple spanning tree instances (MSTI). This protocol has improved the redundancy and capacity of links because we can send traffic for all links at the same time while there is also an alternate path to the root bridge. If we are going to install new switches in a network where there are already switches installed, from my point of view, the new ones don’t have to be mandatory of the same vendor but we should choose switches with the same STP compatibility. Therefore, it’s a best practice to configure standard protocols like MSTP or RSTP instead of proprietary protocols. Finally, most top of rack (ToR) switches also support Shortest Path Bridging (SPB), standardized as IEEE 802.1aq, which has better performance, reliability and real layer 2 multipathing. However, Multi-Chassis Link Aggregation like the implemented by HPE IRF, Aruba VSF and Cisco VSS can also help us to build loop-free logical topologies with much better performance than traditional STP protocols.